Oceans Day (June 8) and Canadian Rivers Day (second Sunday in June) are celebrated together in a celebratory week — Rivers to Oceans Week — from June 8 to 14. This special week focuses on creating an understanding of Canada’s watersheds, our connection to fresh- and saltwater environments, and what we can do to protect them. All creatures — whether people or wildlife — live in a watershed. A watershed is an area of land that water flows across or through on its way to a particular water body. You can think of a watershed as a network of springs, lakes, streams, rivers and wetlands and all of the land that they drain. Rivers flow through a watershed as fresh water makes its journey from land to the salty water of the ocean. We invite you and your students to launch Rivers to Oceans Week at your school. Students conduct imaginary interviews with northern wildlife species, researching and presenting answers to a set of questions in an interview format. Celebrate Rivers to Oceans Week with one heartfelt embrace that will take in all of our northern waters during International Polar Year. Oceans Day, first declared in 1992 at the United Nations Earth Summit, is celebrated every June 8 to raise awareness about the importance of the Earth's oceans, and to inspire us to take better care of them. Canadian Rivers Day, celebrated since 2003, gives Canadians a chance to honour our rivers and the important place they occupy at the heart of our history and natural heritage. The 2007-08 edition of International Polar Year was the third one since one was first proclaimed in 1882. Scientists from all over the world engaged in important research, striving to get a better picture of conditions in the Earth's Polar regions and how they influence the planets oceans, atmosphere, biodiversity and lands. 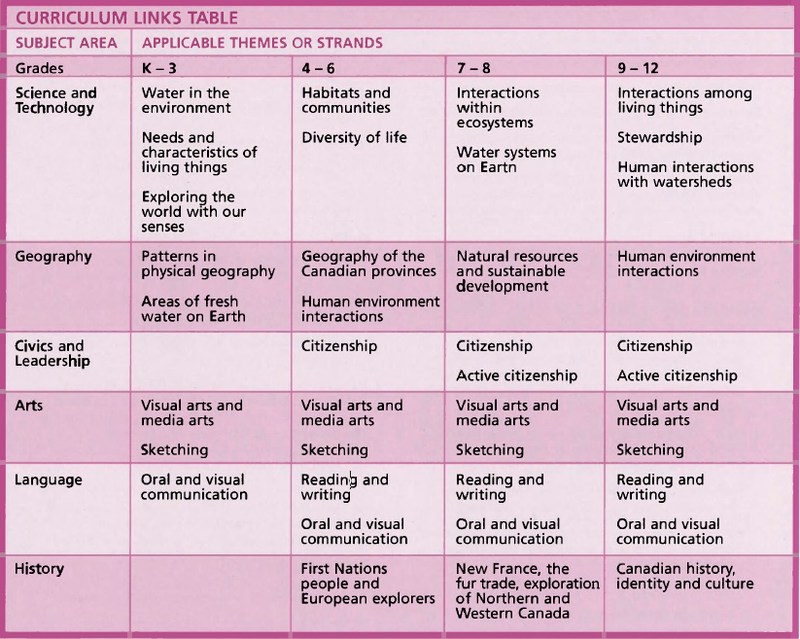 Use this teacher’s guide during Rivers to Oceans Week and throughout the year to inspire learning among your students about Canada’s northern waters. Did you know that if you sculpted a clay model of Canada's landscape and then simulated precipitation by sprinkling water on it, more than half of the water would drain toward Canada's North? • Journey North by River Inc.
Northern waters are a valuable part of Canada’s natural and cultural heritage. Students plan, prepare and present a hands-on or an electronic display on a northern ocean and rivers theme. They may also share their displays with other schools through our website and other media.